Imagine you possess a toolbox that instantly enables you to quickly gain rapport with your clients on multiple levels. A toolbox that instantly and permanently gives yo the confidence to motivate yourself and your clients. However, too often just like a thief, procrastination and stress steals your motivation, opportunities and money. We all know this is a mind thing but do you know how your mind works? When your car needs repair you don’t call a plumber. 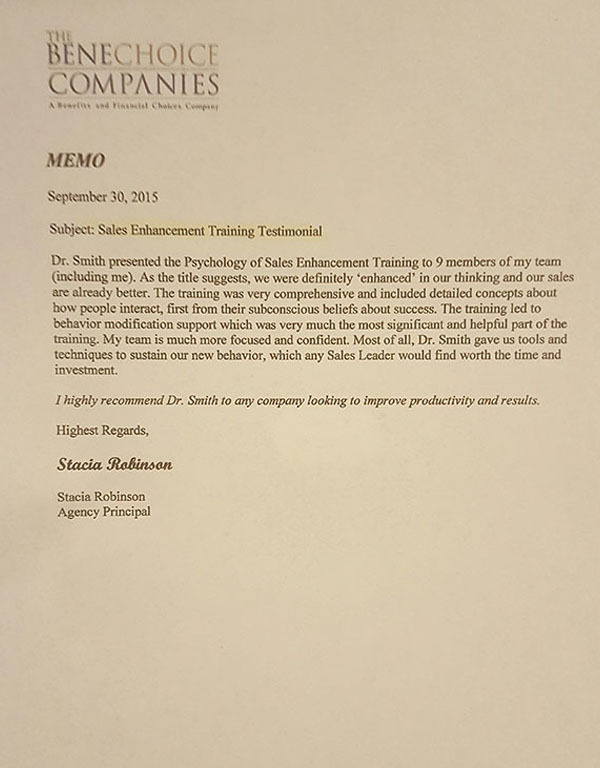 For more than 15 years, Dr. Clinton Smith has empowered sales people with both innovative techniques to close more sales and control stress anywhere and at anytime. This is a 3 hour training program that can be divided into two weekly sessions. It can be delivered on-site or through teleconference in the comfort of your home. How to quickly establish subconscious rapport and apply techniques to drive up your sales. How these tools can improve your personal life and sales performance. How to control your thoughts, feelings, and actions. You will actually learn how to push your own buttons. How to permanently lock in your motivation, confidence and the ideal sales person mentality. How to eliminate fear of failure and success. How to overcome limiting beliefs, negative self-talk, and procrastination. How to use the right words at the right time. Know when to use silence and non-verbal communication to increase rapport and sales. How to use creative meditation for goal setting, visualizing change, and implementing new behavior patterns.